Recent articles describe “mysterious blasts” that are rattling places across the Earth, from Alabama to Michigan, Idaho to California, Russia to Denmark. Similar reports in the last week were reported in Russia, Denmark, Florida, Louisiana and Texas. On Nov. 18 Michigan reports boom/rattle from the towns of Wyandotte, Ecorse, Lincoln Park, etc. On Nov. 8, there were reports in Tennessee. On Nov. 4, in Bend, Oregon. On Nov. 3, in Minnesota. On Nov. 2, in San Diego. Large meteors frequently produce sonic booms which can be heard before they are slowed to below the speed of sound by Earth’s atmosphere. A meteor 100 kilometers high would boom about five minutes after it appears. Such an object is called a “sonic” meteor. Sonic booms from meteors are not a rare event, occurring a dozen times a year over the U.S.
Seismographs scattered throughout the (Los Angeles) basin routinely record the shock waves from sonic booms, but they are easily distinguished from earthquakes. Can you bring out Mazzaroth in its season? He made the Pleiades and Orion; He turns the shadow of death into morning And makes the day dark as night; He calls for the waters of the sea And pours them out on the face of the earth; The Lord is His name. And He said to them, “I was watching Satan fall from heaven like lightning. Some may wonder if there is a connection between the reports of sonic booms being heard all across the planet these last 30 days or so, meteors, the Orionids, and the angels cast from heaven after the Revelation 12 ‘Great Sign’ which when read literally, matches the astronomical alignment that occurred on September 23, 2017 involving the constellation Virgo, the Moon, the Sun and twelve stars. It’s interesting that the Orionids meteor shower began on September 23, 2017 according to the American Meteor Society. As the story goes, about 2020 years ago on Sept. 11, 3 B.C., wise men in the East noticed an unusually bright star in the western sky. We now know with a very high degree of certainty that the celestial object they saw was a conjunction of the planets Venus and Jupiter, which separately are the two brightest objects that can be seen in the evening sky. When the orbits of the two planets came together, one on top of the other like a figure eight, they would have formed the brightest celestial object ever seen by man. A conjunction involving Venus and Jupiter is not rare, it happens every year…often times during the day. What is rare is being able to see it. For the first time since the birth of Christ, a conjunction between Venus and Jupiter will be visible on November 12-13, 2017 on the Eastern horizon just before the sun rises. As the earth turns and the sun begins to rise, the incredibly bright ‘star’ will begin to fade into the daylight.Why do I mention this? I mention it because unlike some, I believe that Biblical astronomy is worthy of study, as it relates to signs of Jesus coming and signs which involve the ‘Sun, Moon and Stars’ as mentioned in the Gospel of Luke 21:25. The upcoming conjunction of Venus and Jupiter is the last astronomical event this year involving a string of highly unusual events which began 3 1/2 years ago. First, there were a series of four blood moons which fell exactly on the Jewish Feast Days of Passover and Feast of Tabernacles (Succot) for two consecutive years. Then there was the Great Eclipse of 2017 which cut a swath of darkness across America from the northwest to the southeast. Then there was the retrograde event of Jupiter for 9 months, 2 weeks and 6 days within the womb of the constellation Virgo, exiting on September 9-10. 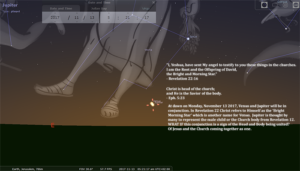 Then there was the Revelation 12 Sign, an alignment of the Sun, Moon, and Stars which matched a literal reading of verses from Revelation 12:1-5. Then there was the predawn conjunction of Venus and Mars, to which I can attest, appeared to be a much brighter star than usual. And next is the predawn conjunction of Venus and Jupiter. 1) In Revelation 22:16 Jesus Himself allegorically states, “I am the bright morning star” which is another name for the planet Venus. Why would He say that? It is theorized that the Venus/Jupiter conjunction is symbolic of Jesus as the Head of the Church, coming together with Jupiter as the Body of Christ, for the first time in 2,000 years. 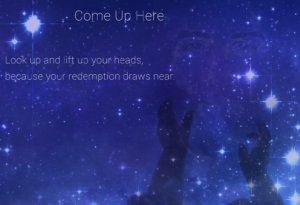 We have already read about the symbolism of Jupiter as the Body of Christ, or the male child in Revelation 12 who is raptured to the throne of God. Jupiter symbolically representing the actual body of Christ as well, as portrayed in Isaiah 53, with stripes and with a bloody red spot where He was pierced on the side. When they are seen for the first time in 2,000 years coming together, Venus will set on top of Jupiter, symbolizing the head on top of the body. 2) Another theory is that Venus represents Satan who is also characterized in the Bible as the ‘morning star’ in Isaiah 14:12: “How you have fallen from heaven, O morning star, son of the dawn! You have been cast down to the earth, you who once laid low the nations!” (NIV). The KJV and NKJV both translate “morning star” as “Lucifer, son of the morning.” The theory states that the church (Jupiter) after having been born from Israel (Virgo) is chased by Satan (Venus) before being ‘caught up’ to the throne of God (raptured). Two other similar words used in the Bible used to describe Jesus and Satan are ‘lion’ and ‘ruler’: Jesus as King is the Lion of Judah, while Satan is the lion who seeks to devour and destroy.Jesus is King of the Universe (Melech ha’Olam), while Satan is referred to as the Prince of the power of the air, Prince of Darkness (Eph.6:12), or the ruler of THIS world (2 Corinthians 4:4) but with limited authority. Between the two theories, I’d be more inclined towards the first one, since Jesus is also described as the Groom who goes to retrieve His bride, the Church, to take her away to the Father’s house. Just as the Bethlehem Star did not signify a specific date to the wise men, but an event, it might just be that the series of unusual astronomical events these last few years should be viewed the same way, as portents of an upcoming event, not of a specific day. What if? Eph 5:23 – Christ IS THE HEAD OF THE CHURCH: AND HE IS THE SAVIOUR OF THE BODY. Col 1:18 – And he is THE HEAD OF THE BODY, THE CHURCH: who is the beginning, the firstborn from the dead; that in all things he might have the preeminence. Rev 22:16 – I Jesus have sent mine angel to testify unto you these things in the churches. 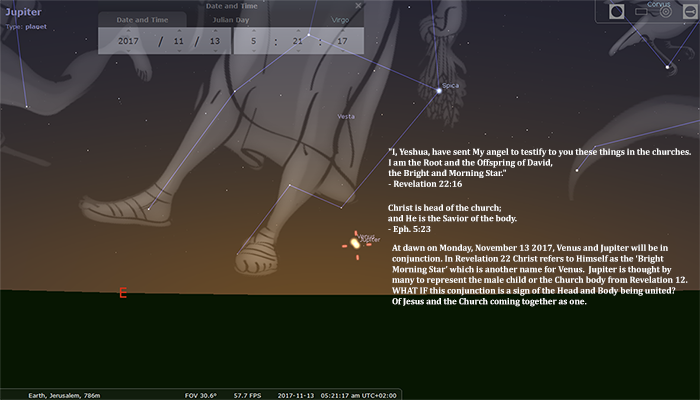 I am the root and the offspring of David, and THE BRIGHT AND MORNING STAR. Rev 2:18-29 – But hold fast what you have till I come. And he who overcomes, and keeps My works until the end, to him I will give power over the nations – ‘He shall rule them with a rod of iron; They shall be dashed to pieces like the potter’s vessels’ as I also have received from My Father; and I will give him the morning star. So it would seem that Rev. 2 does refer to the male child described in Revelation 12, who is given the same rod of iron and who is also given the ‘morning star’. Could this be a portrayal of the Church (male child/Jupiter) coming together with Jesus (Venus/morning star), or it could be said Jesus is going to give Jupiter the morning star (Venus). which itself was 333 days after the last blood moon of September 28, 2015. 50 days after the Revelation 12 Sign of September 23, 2017.
who are eagerly waiting for him. Few people will probably read this, so my fear of ridicule is small. As I’ve mentioned, I’ve been fascinated with the controversy and arguments surrounding the Revelation 12 Sign of 09/23/2017. Publicly, my personal position on the whole thing is and has been ‘Maybe’ and ‘What if?’ Because I honestly don’t know. I’m intrigued by how compelling the narrative has become, the mathematical curiosities associated with it and the very long list of what are either associated coincidences, or possibly not coincidences. To my knowledge, historically speaking, nothing quite like this has very happened before, and I’m not just talking about the astronomical alignment, but how this topic has evolved and created such division. It’s difficult for me to understand how anybody can easily dismiss the observation that a literal reading of the Bible verses in Revelation 12:1-5 describes the astronomical alignment which occurred on 09/23. b) it is purely symbolic. If ‘a’, then the ‘Great Sign’ will involve the Sun, the Moon and the Stars. Our only common knowledge of anything representing a ‘woman’ in the sky would be a constellations of stars. Of the 88 constellations covering the entire sky in the northern and southern hemispheres, I believe only 3 are of women; Andromeda, Cassiopeia and Virgo. Of these three constellations, only Virgo appears in the ecliptic, which is the path that the sun travels across the sky from sunrise to sunset. Virgo is the only constellation in which both the Sun and the Moon are ever in proximity to. So by the process of elimination, the sign would involve the constellation Virgo (symbolic of the Virgin) the Sun, the Moon and 12 stars. If ‘b’, then any attempt to apply a literal fulfillment to the ‘Great Sign’ would be a waste of time. But I don’t think there are any examples of ‘signs’ which were not manifested in the physical world. By definition, a ‘sign’ would suggest that there is evidence of something specific. Revelation is a tricky book to decipher. What is symbolic and what is not? and Who is to say? According to many in Israel, this is the Year of Jubliee. Yesterday was Yom Kippur, the Day of Atonement. Seven days ago was the astronomical alignment being termed ‘The Revelation 12 Sign’ which involved the Sun, the Moon, the planets Mercury, Mars, Venus and the constellations Virgo and Leo. Ten days ago is when Yom Teruah, the Feast of Trumpets began. Other than two major volcanic eruptions in Bali, and a handful of ISIS related terrorist attacks on innocent civilians, what have become almost everyday, commonplace occurences, no global events on a Biblical scale have happened yet, like the Rapture. Rabbi Samuel Ben Judah, who died in 1517, used Torah to base his opinion that 2017 would be a Year of Jubilee. Israel’s Prime Minister Benjamin Netanyahu proclaimed from the United Nations last week that this was currently Israel’s Jubilee in that it has been 50 years since the liberation of Jerusalem and 100 years since the Balfour Declaration. This Sunday morning, someone posted a YouTube video clip from a few years ago, of American soldiers during a worship service singing ‘Days of Elijah’ written by Robin Mark in 1994. I’m not yet sure why I’m also seeing “Francis Robert Mark” as being credited with the lyrics. 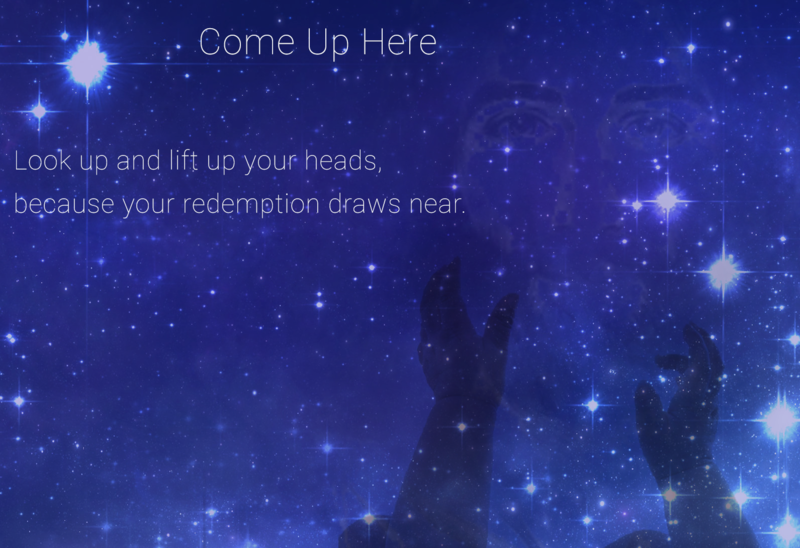 Anyhow, I’ve always liked this song, and especially hearing so many of our men and women in uniform passionately signing it, but today you might say that the lyrics struck a chord for me…the scriptures which Robin Mark chose to create the lyrics of this song closely parallel the Blessed Hope of those who are currently watching for the Rapture, anticipating hearing the Trumpet Call at any minute. Some are looking at the Barley Harvest, which if not mature enough by a certain date pushes the Feast of Trumpets out 30 days as an extra month is mandated to be added to the calendar that year. It has been reported that this year the Barley harvest hadn’t been this immature this 2005. Jesus rose from the dead on Sunday, and Sunday is recognized as the sabbath by the Church. Some believe that the Jubilee doesn’t end until Sunday, Oct. 1st due to celestial relationship of the sun and moon on Elul 1. Some attach significance to 400 days from a conjunction of Venus and Jupiter on Aug. 27, 2016 ends on Oct. 1st at sundown. I checked this, the conjunction was right next to Virgo’s head at sundown as seen from Jerusalem and would have been visible for 1 hour before sunset. Some have suggested that if God gave Noah 7 days warning before the Flood began, then it began on the 8th day and 8 days from Sept. 23rd would be October 1st. One skeptical pastor who I’ve had a lengthy conversation with on this topic has suggested that the Revelation 12 Sign needs to have a ‘shelf life’…if nothing happens within a reasonable period of time, then it wasn’t what people thought it was. From here, all we can do is wait, Watch, and see.